So ... I'm about to say something that people across the world will hate me for ... are you ready? It's nearly the end of Summer and Autumn is near << there I said it! People who are holding onto Summer as much as they can now probably hate me. I've started buying little things here and there to bolster my wardrobe with Autumn-related things ... or maybe even Christmas. 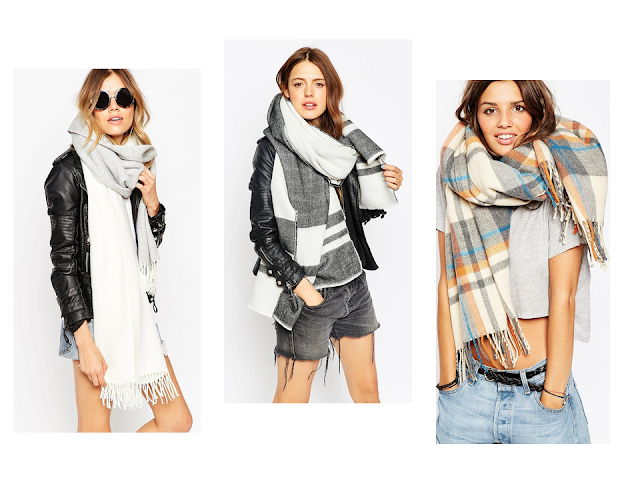 The first thing I spied on ASOS was scarfs! Obviously these scarfs are more directed at woman however the men's scarf range is lacking and I actually prefer woman over men (when it comes to scarfs, not generally lol). I actually bought this earlier in the week and it is very soft. I love the size of it and even though its thin - because you double it up it still keeps you warm. It's a lovely white/cream/grey colour. It costs: £14.00. Check it out HERE. I like the block effect on this scarf when it is being worn. I also like the fact its reversible so you can have white or black or both. This one is a bit more expensive that the first at £20.00. Check it out HERE. This is much more colourful scarf compared to the last two and it has a tartan effect which reminds me of Scotland. This one costs: £18.00. Check it out HERE. I'm currently in the process of choosing some more Autumn-ey items so I'll hopefully have another post or 'haul video' up soon. Let me know what you think of my choices in the comments below and let me know if you have bought anything for Autumn or Christmas yet or if you think its too early.